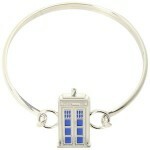 A bracelet is a fun way to shows something you like and if Doctor Who is that thing then you have to check out this bracelet. This is a string bracelet that looks like two piece of leather string and in the middle a charm that is a Weeping Angel. So people that look at this bracelet should not blink and keep staring at it. A bracelet like this is fun and is great for almost any occasion except for the fancy dress up kind. I just imagine people wearing this with a fun t-shirt while enjoying summer.